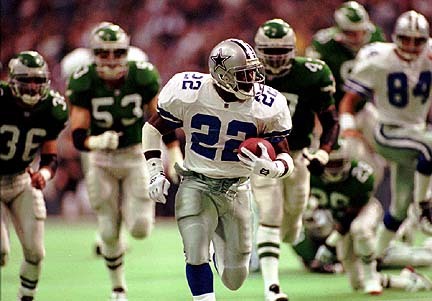 Bob's Spot: THE Emmitt Smith Home Page! Drafted: Selected by the Dallas Cowboys in the first round (17th pick overall) of the 1990 NFL Draft. Acquired: Re-signed on September 16, 1993 by the Dallas Cowboys as a free agent. - Missed most of the preseason due to a sprained right knee. - Has a TD in 36 of his last 38 games, including playoffs. - Established a new team-record with 35 carries on Nov. 7 vs.
Smith had never missed a start due to injury in his 87 career games. - Passed 5,000 yard mark in game vs. Miami on Thanksgiving day. 100 yards in a Super Bowl. - Had a career-high 117 yards receiving on Nov. 18 vs. LA Rams. - Fifth leading all-time rusher in SEC history. PICS: That's all I need to say! ACE'S PLACE! : Of course I'm gonna plug my own Personal Home Page! The Jokesters Page: Tons of funny jokes!